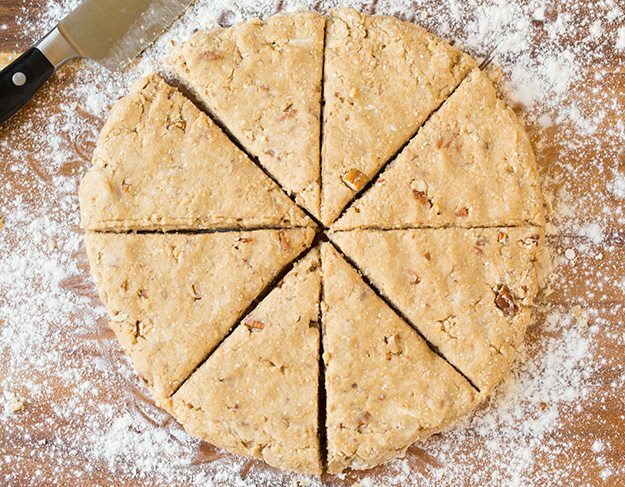 Maple Oat Pecan Scones are a must try treat! 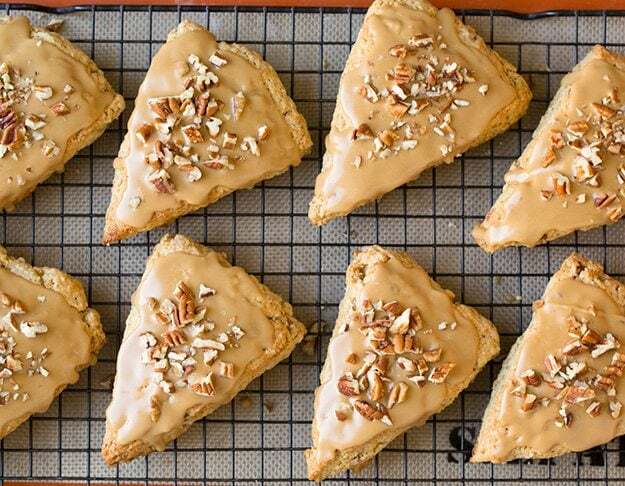 Tender, buttery scones are filled with oats and pecans and finished with a sweet maple glaze. Perfect for a weekend breakfast or brunch party. We all need dessert for breakfast once in a while, right? 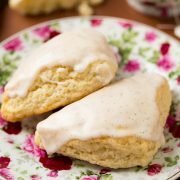 Scones are great for a special occasion breakfast or brunch, and they make for a great weekend treat. 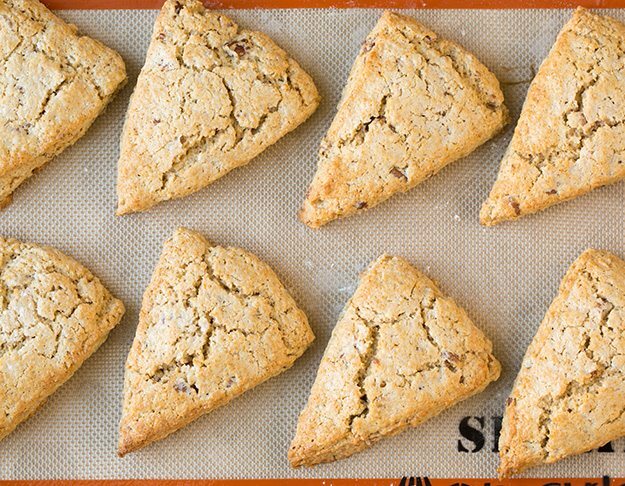 I love scones but they need to be made the right way. I’ve had too many dry, lifeless scones from bakeries that definitely weren’t worth paying for. 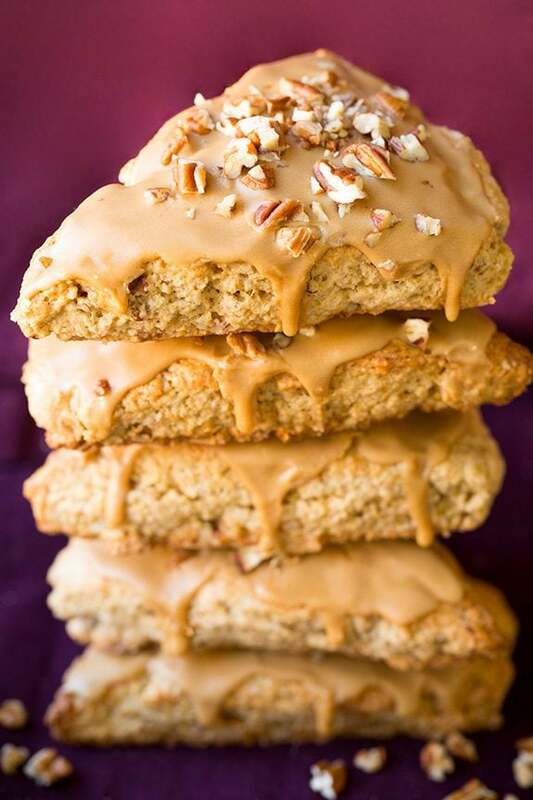 These are perfectly soft, tender and moist and you’ll love the maple, oat and pecan flavor combination. 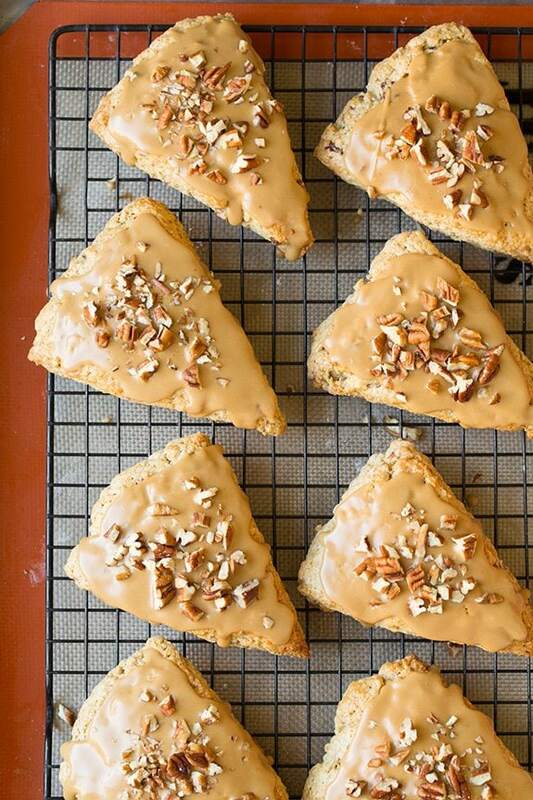 They are a perfect fall scone and trust me, they are hard to resist! In my opinion these are best served when they are still a bit warm. They melt in your mouth at that point. Yes, they are definitely still good once they cool off completely, but just like many other baked goods they are amazing when eaten warm. I love how hearty these scones are with their addition of oats and nuts, which you don’t find in a plain scone. I also like that they have some sweetness to them. I don’t like a scone that only has a few tablespoons of sugar, I might as well just eat a good biscuit slathered with butter instead. 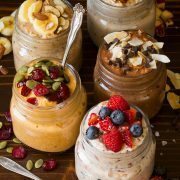 Though this recipe requires a few extra steps like freezing and grating the butter and grinding the oats, the end result is well worth it. Once you’re biting into one of these you’ll realize those few extra steps were worth it. 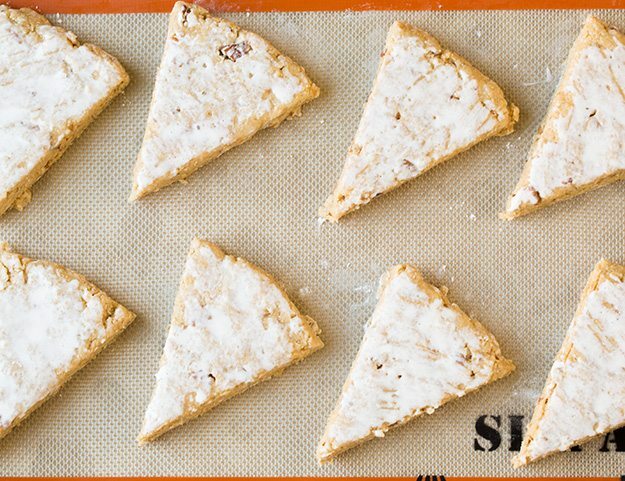 These scones are dreamy. I am so happy to announce that I will be partnering with Fisher nuts over the next year to bring you many delicious recipes, all made with Fisher nuts. 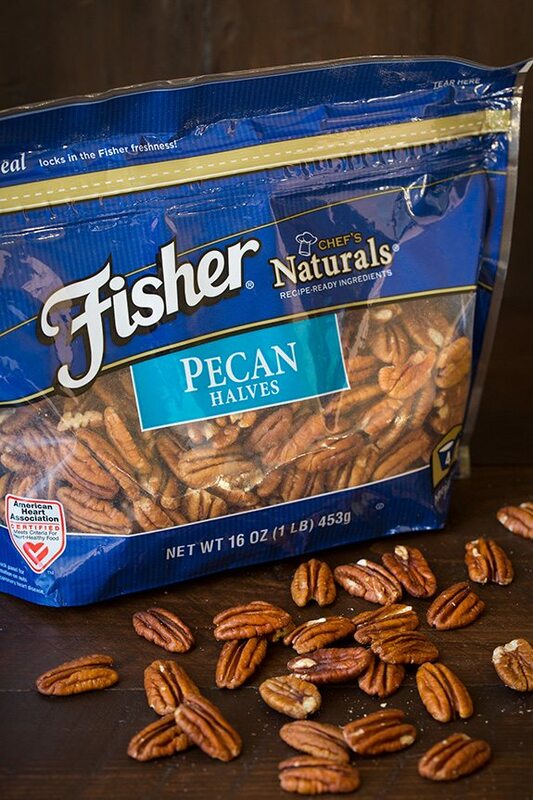 I chose to work with Fisher nuts because it is the only brand of recipe nuts entirely without preservatives. 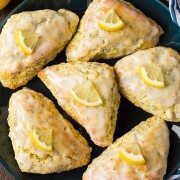 More Irresistible Scone Recipes to Try! These are a must try treat! 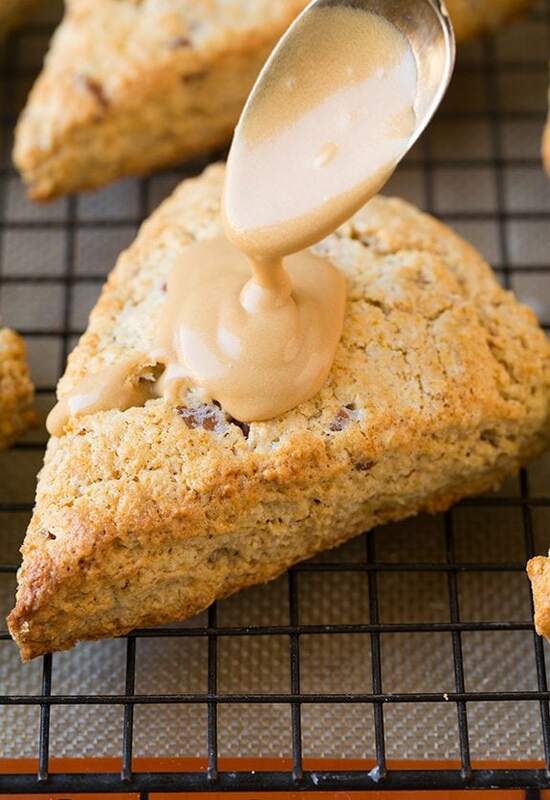 Tender, buttery scones are filled with oats and pecans and finished with a sweet maple glaze. Perfect for a weekend breakfast or brunch party. For the scones: Preheat oven to 425 degrees. Line a baking sheet with parchment paper or a silicone liner. In a food processor, pulse oats until ground into a flour, about 1 - 2 minutes. Pour oats into a large mixing bowl along with flour, brown sugar, granulated sugar, baking powder, baking soda and salt. Whisk well to combine while breaking up clumps of brown sugar. In a small mixing bowl whisk together 1/2 cup of the heavy cream, the egg, maple extract and vanilla extract. Grate butter on the small holes of a box grater and add to flour mixture (use a butter knife to scrape any excess from grater). 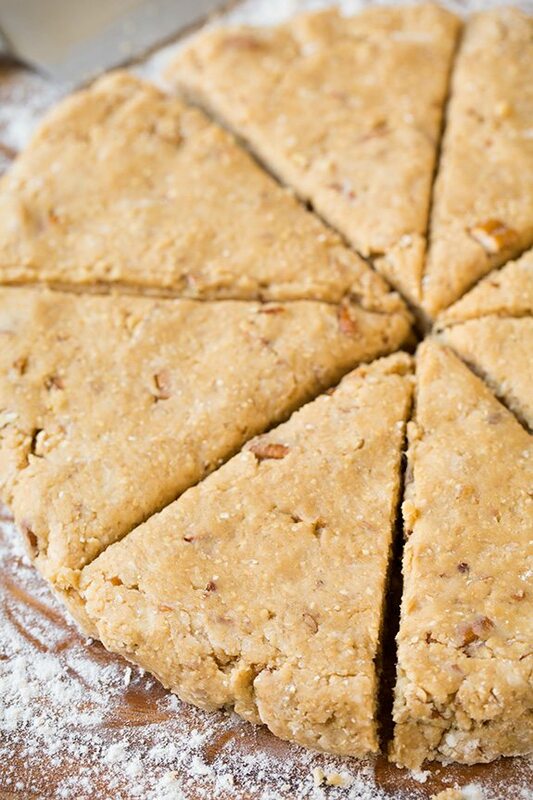 Cut butter into flour mixture using a pastry cutter or fork until it resembles a coarse meal. Stir in 2/3 cup of the pecans. Pour cream mixture into flour mixture and toss with a rubber spatula until evenly moistened and it starts to come together in large clumps, then gently knead mixture in bowl by hand several times until it comes together. Pour into a lightly floured surface and gently pat and shape into a 8 1/2-inch round. Cut into 8 equal wedges. Transfer to prepared baking sheet and brush tops with remaining 1 Tbsp heavy cream. Bake in preheated oven until golden, about 13 - 15 minutes. Cool on a wire rack until lukewarm then spoon and spread glaze over scones and sprinkle with remaining 1/3 cup pecans. Allow glaze to set at room temperature, store in an airtight container. For the glaze: Whisk together all glaze ingredients in a small mixing until well combined. Thin with additional cream as needed, 1 tsp at a time.